Thomas A. Bailey: Dead and Forgotten by His Publisher? Two of Ray Raphael’s recent books, "Constitutional Myths: What We Get Wrong and How To Get It Right" and the tenth anniversary revised edition of "Founding Myths: Stories That Hide Our Patriotic Past," discuss historical mythologies in textbooks. 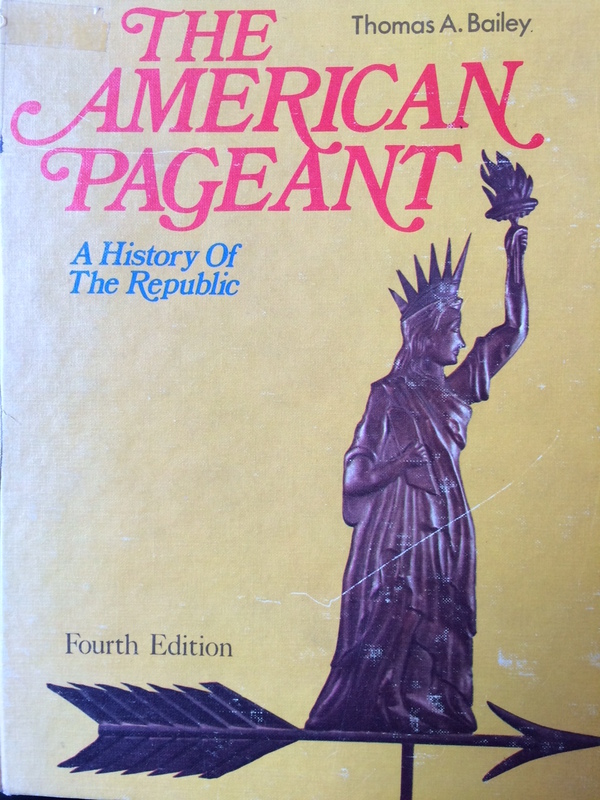 Under normal circumstances, the striking resemblance between these would be conclusive proof of plagiarism, but there is an extenuating circumstance here: Bailey’s book was the first edition of The American Pageant, and Kennedy’s and Cohen’s the fifteenth, published in 2013. Yet why, if Thomas Bailey wrote much of this highly successful historical narrative, does his name not appear on either the cover or the title page of the latest edition? Customarily, when textbooks are revised, the names of new authors are added to original ones, and for decades the publishers of American Pageant—Heath, Houghton Mifflin, and Cengage—followed this tradition. In the sixth edition, published in 1979, 76-year-old Bailey took Kennedy on as a partner, both receiving credit, and when Bailey died four years later, his name survived intact. In 1998, for the eleventh edition, Cohen joined the team, and the triumvirate was recognized through the fourteenth edition. But in 2013, breaking with custom, Cengage, the current publisher, decided to forsake the lead author, no longer a recognized luminary. Kennedy and Cohen became for all intents and purposes authors-of-record at this juncture, fully credited on the cover and title page. Commercially, rebranding makes sense. Publishers want their texts to be seen as new and current, and removing Bailey’s name distances American Pageant from its mid-twentieth century roots. Cengage does not want students to think that they are reading many of the same passages that their grandparents or even great-grandparents might have read when they went to college in the 1950s. While the packaging is different, however, much of the product remains the same. 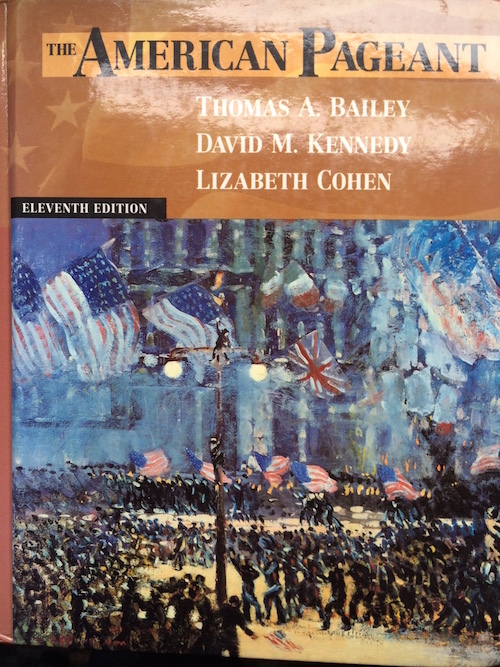 David Kennedy and Lizabeth Cohen, highly regarded scholars specializing in 20th Century history, added much to American Pageant, but for lengthy sections in Volume I, they left Bailey’s distinctive prose virtually untouched. The fifteenth edition’s chapter on Manifest Destiny, for instance, mirrors the original; only two paragraphs have been dropped and no new material added. Line edits are primarily word choices (“stunned” for “crestfallen”; “land hungry” for “expansionist”; “faraway California” for “sun-drenched California”) and transposition of phrases. (“As wars go, the Mexican War was a small one” replaces “The Mexican War was a small one, as wars go.”) In this chapter, which details United States expansion in the mid-nineteenth century, the recent edition, like its predecessor, includes not a word about the injurious impact on the Native nations. Bailey’s treatment of the Founding Era, from the Stamp Act in 1765 to ratification of the Constitution in 1788, remains almost entirely intact. Additions include one 56-word paragraph about women in the Revolutionary War; three paragraphs about blacks in the war; a short section on republican virtue and “republican motherhood”; one paragraph about executive powers in the Constitution; brief treatments of early abolitionism, the quest for religious freedom, and democratic elements in the state constitutions and the U.S. Constitution; and a two-page insert that incorporates the rest of the New World into the narrative. Together, these amount to fewer than five of fifty-eight pages; the rest, almost to the word, is Bailey’s. Revisions in other sections of Volume I, aligning closely with current paradigms, are more significant. New chapters on the colonial era treat African-Americans and Native Americans in far greater depth, and a Jim Crow bias no longer taints the narrative on Reconstruction. Yet Bailey’s pen is still much in evidence, as it is throughout. Sometimes this works to the text’s benefit. The original treatment of the American Revolution as a global war, unchanged, is unsurpassed by any later text. Removed from prominent view, Bailey does surface in a prefatory section called “About the Authors.” Here Cengage credits him with being “the original author” of American Pageant who “saw it through its first seven editions.” This attribution is readily overlooked, however, buried as it is on p. xxix following a seven-page table of contents, a list of maps, another of available supplements, some remarks about goals and content revisions, and acknowledgements that give a nod to over fifty teachers who contributed to or reviewed the revised text, but do not mention Bailey. (Bailey’s original acknowledgement confessed “deep indebtedness” to over one hundred colleagues, ten students, and various editorial and secretarial personnel.) Although honored as an author emeritus of sorts, he is simultaneously demoted. Kennedy and Cohen appear in photos, but Bailey is not pictured. Three of Kennedy’s other books and three of Cohen’s receive considerable notice, but Bailey’s scholarship is quickly summarized and subordinated to his textbook: “He was the author, editor, or co-editor of some twenty books, but the work in which he took most pride was The American Pageant.” While Kennedy and Cohen receive one page each, the nine lines devoted to Bailey take up only one-quarter of a page; the rest is left blank. That page could easily have been filled. Bailey’s pioneering scholarship emphasized the impact of public opinion on foreign policy throughout American history. His first major book, Theodore Roosevelt and the Japanese-American Crisis, detailed how racist attitudes toward Japanese-Americans in the first decade of the twentieth-century, and in particular San Francisco’s 1906 segregation of students into an “Oriental school,” led the nation to the brink of war. (This was published well before World War II and Japanese-American internment). Other works explored public opinion and imperialism; foreign relations before, during, and after World War I; Russian-American relations throughout history; and the Marshall Plan. In The Man in the Street (1948), he wrote, “The most powerful nation in the world today is the United States, and consequently the most powerful body of public opinion in existence is formed by the American people. What the government in Washington does or fails to do in the field of foreign affairs will depend largely on the wishes of our citizens, and what our citizens demand or fail to demand will affect mightily the destiny of this planet.” He berated the public for its ignorance, and he did his part to correct this by writing not only The American Pageant but also A Diplomatic History of the American People, which went through ten editions. Eleventh Edition featuring all 3 names. The AHA warns with reason against endangering historical inquiry. In the historical community, we date documents in order to understand their context. A textbook is an historical document, and words penned in 1956 should be identified as such, not attributed to the twenty-first century. More is at stake here than the repute and standing of any single author. Chronological distinctions and accurate attribution form history’s substrate, the foundation on which any text must rest, and the foundation of our very profession. Legal fine points aside, textbook publishers must accept the preeminence of such standards and not allow marketing strategies to subvert them. POSTCRIPT More than a year ago, I expressed my concern about authorship of American Pageant to its publisher. 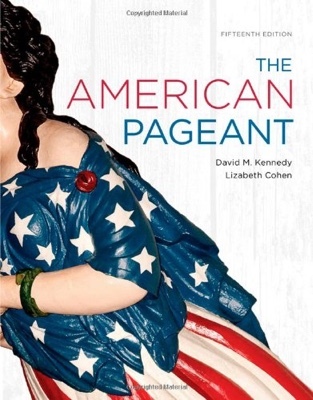 The response was brief: “Thanks for your feedback!” Cengage is now promoting the sixteenth edition of American Pageant, dated 2016, authored by David M. Kennedy and Lizabeth Cohen.